In the Western world, the Ming dynasty is probably best known for its blue-and-white porcelain. However, what many of us might not know is that there is much more than porcelain behind this dynasty that ruled China for almost three centuries. 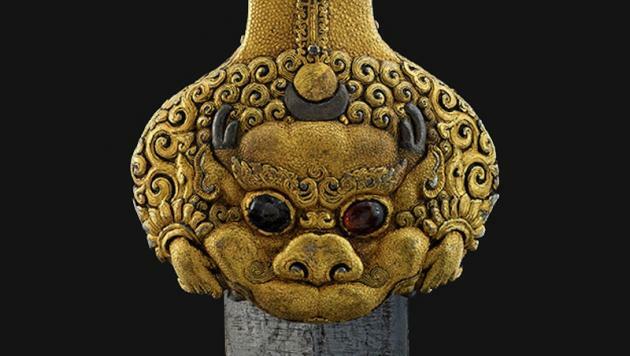 The exhibition now on at the British Museum – open until January 5th – provides great insights on the life of the emperors and their courts during this Golden Age of China. Exploring the whole three-century period of the dynasty in an exhibition would be an impossible task so the curators decided to focus on the 50 years between 1400 and 1450 that represent the peak of the Ming reign. The exhibition looks at the elite society of the time through different aspects of palace life, war, religion, art and trade. The objects displayed include a vast selection of red lacquer furniture, scroll paintings on silk, jade and precious gems jewellery, sculpture, ceramic and the famous blue-and-white ceramic. It shows how the aesthetic preferences of the culturally complex and sophisticated elite were all about the bling, in the attempt to show the status and prestige of the dynasty through its artefacts. Even those visitors who don’t have any knowledge of Chinese history will easily gain the necessary context to the exhibition through the detailed yet easy-to-ready descriptions provided. Firstly, the material provided introduces the four emperors who reigned during these fifty years and their defining traits: the Yongle emperor (“the warrior”); the Hongxi emperor (“the bureaucrat”): the Xuande emperor (“the aesthete”) and the Zhengtong emperor (“the boy”). In order to govern the territory, they sent several princes to live in often remote estates where the court life was reproduced on a smaller scale. The exhibition also explores the powerful role played by eunuchs – castrated boys or men; during the Ming reign, they were involved in the organisation of the court and the education of women as well as in many other artistic activities. Through some of the objects shown, the visitor can also learn more about the pastimes and preferences of the time. The emperors and their courts liked visual art – from painting to calligraphy – but they also played chess and kept fit for war with a series of different sports. A painted scroll, lent by the Palace Museum in Beijing, depicts the sovereign and his entourage while engaging in archery, golf, horsemanship and even football. From a socio-political point of view, the exhibition suggests that these 50 years have deeply affected the history of China; during this period, the capital was transferred from Nanjing to Beijing and the construction of the Forbidden City was started. The Ming dynasty also had a cosmopolitan attitude and thanks to the fact that it was a fairly peaceful time –mainly characterised by political stability, the emperors’ interest shifted towards other lands, through several voyages to the Western Ocean. Some of the objects confirm strong links to the Middle East and East Africa as well as other neighbouring countries, whose influence can be seen both in fashion and in the arts. However, it could be argued that, despite showing a significant level of change, the exhibition also displays a certain cultural resilience and a strong attachment to traditions. This would suggest that the society of the time had a more conservative attitude rather than a cosmopolitan and outward-looking one. Cultural debate aside, the exhibition is organised with great attention to detail and cleverly presents what would otherwise be an overwhelming amount of details. It represents a great opportunity to see beautifully crafted objects, drawn from museums across China and the rest of the world as well as recently discovered through new excavations over the last decade. A definite must-see!